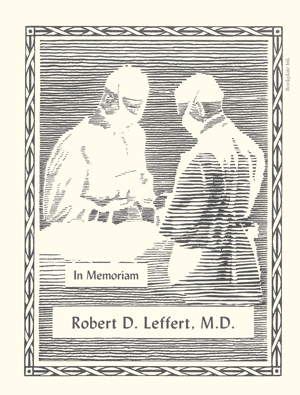 The design Dr. Leffert’s sister and brother-in-law wanted to use was Bookplate Ink’s D62, which shows two surgeons at work. This design was created by woodcut artist Harry Roth, who escaped from Germany just prior to World War II. 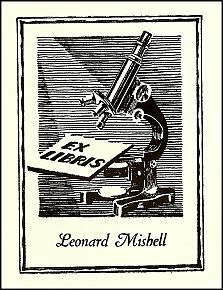 The Antioch Bookplate Company began offering it in the 1940s. Harry Roth created two other bookplates for Antioch that weren’t quite as popular, D-9 and D-10. He seemed to have a penchant for medicine. The D62 design that we usually print has the text “ex libris” included, which means “from the library of.” Dr. Leffert’s sister and brother-in-law asked that this text be changed to “In Memoriam” for this order. As a side note, I appreciate when customers call with questions about changes that can be made to our designs. Even though this can be time-consuming, I’d rather have people ask. We aren’t able to show all the options that are possible with our bookplate designs, and we specialize in personalization. 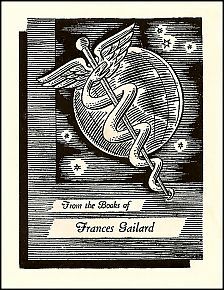 I’m writing to thank you for the help and beautiful work on the surgeon’s bookplate in memory of my brother, who was a wonderful surgeon. We’ve begun pasting these into his books (a very simple job), which will become part of a library for doctors from Partners in Health, who bring their expertise to Haiti. I think my brother would have loved these plates – and they have made me smile! We don’t have bookplate designs that are strictly for “In Memoriam” bookplates. Most of our customers find artwork that is appropriate for their use, whether it be a border design or something more elaborate, and request the text of their choosing. This gives the customer more flexibility and more customization.